It’s a magical drink, complete with a mountain of whipped cream, fluffy marshmallows and rainbow sprinkles. Just the perfect mythical treat you need for those cold winter nights. Place the white chocolate, milk, sugar and vanilla essence in a sauce pan. Heat over medium heat, whisking continuously until the chocolate has melted completely. Make sure not to bring it to boil. Whisk in the pink food colouring gel until you get your desired colour (preferably pastel pink). 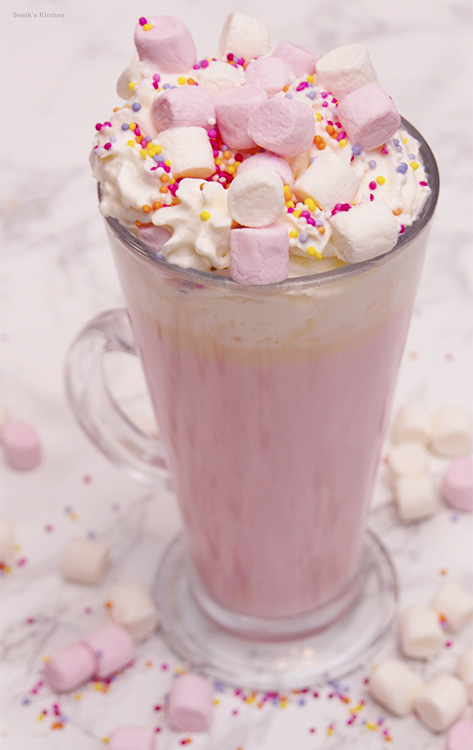 Pour the liquid into individual mugs and top it with whipped cream, marshmallows and colourful sprinkles.